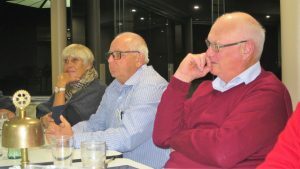 Narooma Rotary Beacon 21 June 2018 – Narooma Rotary Club Inc.
We had a very busy combined Board meeting last Thursday, our last Board meeting for the 2017/18 Rotary year. At last week’s combined Board meeting, Angie Ulrichsen, incoming President Rod Walker and current President Bob Aston. $1,000 to the RAWCS Dental Project in Timor Leste. Members will recall that Charmaine will be heading there next month to work with this valuable project. The Board also agreed to transfer $4,500 from the charity account to the scholarship account. This will allow us to make Second Semester payments without having to dip into our term deposit. The Board also accepted, with regret, the resignations of Bob Antill and Michael O’Connor from the Club. We have written to Bob and Michael thanking them for their service. The Board has offered Bob honorary membership of the Club which I am pleased to advise he has accepted. Members are reminders that even though the changeover will not take place until 4 August, Rod and the new Board will take up office from 1 July. Although the changeover is an important event it is really a celebration of our achievements and an opportunity to introduce the new Board to the community. A reminder that if you are an apology for a meeting or if you have guests, please advise me by email by 4pm each Tuesday. 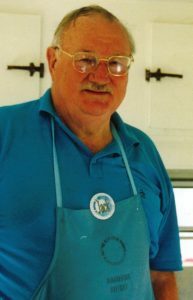 Jack Ings working in our old Rotary food van circa 2000. President Bob received a lovely note from Jack Ings, a past president of this club and a past District Governor (the only one from our Club) in response to the invitation to our 60th celebrations. Unfortunately he will be unable to join us. Jack wrote the history of Narooma Club for our 40th anniversary which resulted in the Club receiving a PR recognition. He was regarded affectionately by many Narooma members as the supreme Rotary statesman. For many years during the annual Cinders Challenge with Moruya if there was a series of questions on who’s who in Rotary, ‘Jack Ings’ was often our default answer. It is obvious from Jack’s continued involvement, he still deserves that status. At Moruya… President Bob and Peter Bull will represent our Club at Moruya Changeover. Moruya President Mike Dent in this week’s Changeover Bulletin says one of the highlights was the outstandingly successful Drugs Meeting in April which attracted over 200 people to discuss drug and alcohol problems in the Eurobodalla. He still hopes they can secure funding for a Local Drug Action Team to initiate programs to address the prevention of AOD problems. Another highlight was Moruya Club funding seven ShelterBoxes, thanks largely to the efforts of Alan Shephard and team at Moruya Markets throughout the year. Mike concluded: ‘So where to from here … we have a great club but we cannot rest on our laurels and we must confront the future to ensure our continued success. We need to attract new members and vary our programs to meet changing trends in our society.’ Moruya’s incoming President is Ward Hack. John Rungen and Laurelle will represent the Club at Batemans Bay’s Changeover on Thursday. Maureen Manning is the outgoing President. Batemans Bay Rotarians are currently working through the ‘visioning process’ towards their Strategic Plan for 2018-2019. President Elect Alan Russell is pleased everyone has been so open and willing to contribute ideas. The first part was a Club Audit. The second part was discussing ‘what if’ scenarios which offered members the chance to discuss things that had not been discussed for some time and ways forward for the Club. The next part involves each new Director developing their Objectives for the year and presenting them to the Board. The final stage is their Strategic Plan. Our guest speaker this week is Allan Rees from the 350 Eurobodalla climate action group, accompanied by Paula Howe another member of the team. The goal of the worldwide 350.org movement is to restore the planet to health through a rapid transition to 100% renewables in our area and across Australia and no new fossil fuel projects. Don’t forget to let President Bob know by email by Tuesday 4pm if you are an apology or if you are bringing any guests.